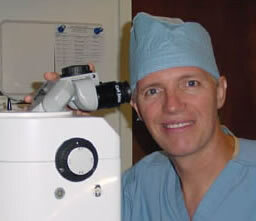 It's not hard to find eye doctors in the Greater Chicago Area who perform LASIK vision correction surgery. But when it comes to something as special as your vision, you want a well-trained surgeon with stellar credentials and an impeccable bedside manner. You also want a doctor who practices in an office that's appointed with the latest in eye care technology, and who employs staff who consider patient satisfaction to be Job One. That's why you arrived at Foulkes Vision — because the high standards established by our medical director, Dr. Richard Foulkes, carry through to every aspect of our work. When you need a LASIK or cataract surgeon in the Chicago area, please contact Foulkes Vision online or by telephone to schedule your free consultation with one of our Chicago-area eye doctors: 630-724-1400. Number One: Dr. Foulkes wants you to know that he cares. Don't be surprised when our eye surgeon thanks you for entrusting him and the staff at Foulkes Vision with something as sensitive as your vision and eye health. Number Two: Dr. Foulkes is a hands-on Chicago LASIK surgeon who will guide you through the procedure and make sure that you're absolutely comfortable with everyone he's hand-selected to round out our practice staff. Number Three: After you've had surgery at Foulkes Vision, our eye doctor makes sure that you have his business card and personal cell phone number. That means you’ll be able to reach Dr. Foulkes anytime, day or night, should you have concerns about how your eyes are healing after surgery. Not only does Dr. Foulkes, who is a clinical researcher and a medical monitor, insist on carrying the latest, state-of-the-art ophthalmology equipment to provide patients with the best possible eye care, our staff also goes to great lengths to make sure that the practice office is comfortable and inviting for you. We know this makes a big difference for patients who may be feeling insecure about eye surgery. We also make use of patient educational videos and handouts, and take the time to answer your every question about our procedures, so that you feel absolutely certain you're in the right play for your Chicago eye surgery. "Like most people, I was a little scared at first of having my 'eyes zapped.’ I am so glad now that I had it done, and I would highly recommend (LASIK) to anyone." "I really enjoyed and appreciated the fact that I was treated individually and not as a number added to the sale conquest." "The staff, including Dr. Foulkes, went out of their way to make sure any questions or anxieties I had were answered." "I just wanted to let you know how pleased I am with my recent laser surgery. My eyesight remains perfect..."
Simply pick up the phone and call us at 630-724-1400, or contact Foulkes Vision in Lombard, Illinois online today to schedule your free consultation with our eye surgeon.